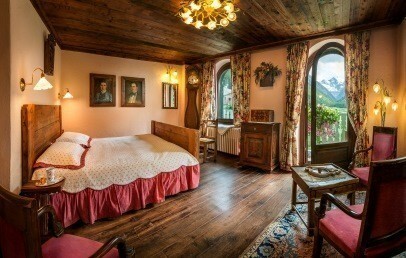 for an Alpine haven offering a regenerating and relaxing holiday. 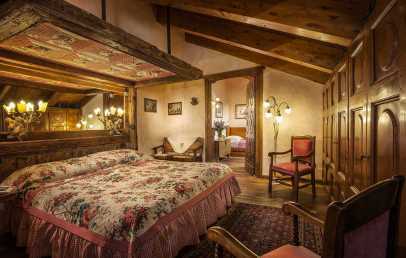 Framed in green pasturelands and snow-capped peaks, the Bellevue Hotel & Spa is situated on the outskirts of Cogne, a charming Alpine hamlet with a story-tale atmosphere, and considered the ‘capital’ of the Gran Paradiso National Park. The Hotel’s position makes it simple to reach the main attractions of the Valle d’Aosta: the Lillaz Waterfalls (3 km), the botanical garden in Valnontey (3 km), Pont d'Ael (18 km), Aosta (28 km), the Skyway Monte Bianco (50 km.) and the famous medieval castles which dot the region. A historic hotel with a welcoming family ambience, the Bellevue Hotel & Spa has always been marked by its warm, impeccable hospitality. It is listed as one of the “Locali storici d’Italia” (Historic Establishment of Italy) and is included in the Relais & Châteaux selection. Among its numerous awards stands out the prestigious Michelin star, the pride of the cuisine of Le Petit Restaurant since 2003. 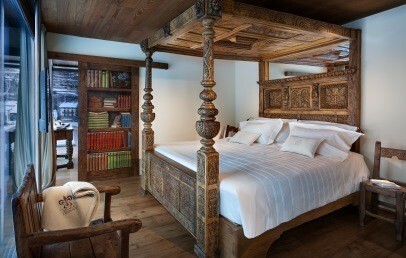 The 39 rooms of the hotel are large and welcoming with a warm Alpine ambience. 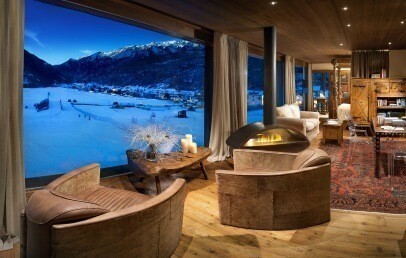 All differing one from the other, some have a fireplace and hydromassage tub, others a private sauna. 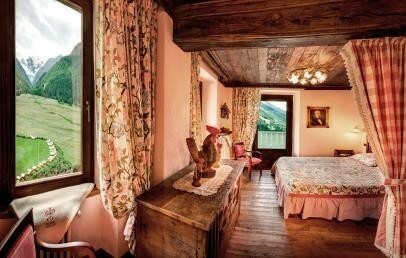 Some rooms have a balcony with a view either of the village or over Gran Paradiso. With its 1200 m2 dedicated to relaxation, “Le Sorgenti del Gran Paradiso” is a fine wellness centre blending the fascination of the mountains with the warmth of spring waters. The centre, which was awarded the "Prix Villégiature 2013" as best Hotel Spa in Europe, offers guests: two pools with water jets, six types of sauna, two steam baths, a large salt cave, a hydromassage pool, a polar cave, a sensory shower, a fitness room with Technogym equipment and several relaxation areas. Children are only allowed use of the main pool with hydromassage from 8 am to 8 pm. Several face and body treatments (both individual and couple ones) are available with payment of a supplement. An unparalleled venue for the lovers of winter sports, the Valle d’Aosta offers a wide range of snow activities: Nordic ski, Alpine skiing and snowboarding, icefall climbing, ice skating and ruisseling, trekking in the snow, walks with snow rackets and tours on horse-drawn sleighs. The summer months offer the green delights of the region and its beautiful rushing streams: walks and excursions, horse riding and mountain bike, Alpine climbing and free climbing, rafting, hydrospeed and kayak. Guests can transform their stay into a true gourmet experience, sampling each of the hotel’s four restaurants, discovering the culinary traditions of the Val’Aosta. The Bellevue restaurant has an à la carte menu and offers each day a menu of a few exceptional dishes, created with the freshest of the season’s products. If the weather allows it, we suggest lunch on the splendid Terrace, which looks out over the meadows of San Orso and the Gran Paradiso. With just four tables and a cuisine awarded one Michelin star, Le Petit Restaurant offers stylish dishes with their roots deep in mountain tradition. 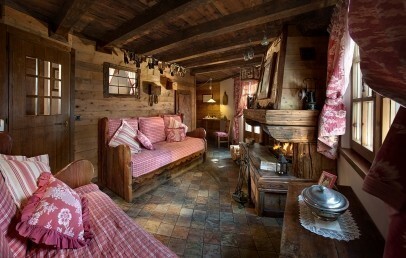 An old converted alpine dairy heated by a large fireplace hosts the typical restaurant Bar à Fromage, restaurant de montagne, a unique venue enabling guests to re-discover the tastes and atmosphere of the area’s traditions. The Brasserie du Bon Bec, on the village square, offers the simple convivial recipes of the Western Alps. Included in the cost of your stay is use of the garage, free access to the wellness centre, the eco-friendly shuttle bus to the different areas of Cogne, Wi-Fi connection and internet point. Every afternoon from 4.30 to 5 pm the hotel offers guests tea in front of the fireplace. 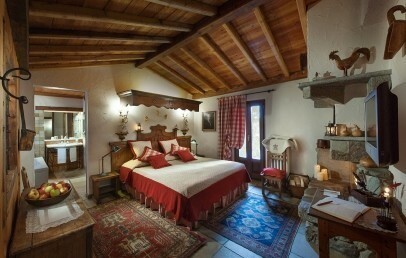 With prior notification on booking, dogs are allowed in the rooms with stone floors (€ 16 per night, meals not included). Dogs have no access to the Bellevue Restaurant and to Le Petit Restaurant. 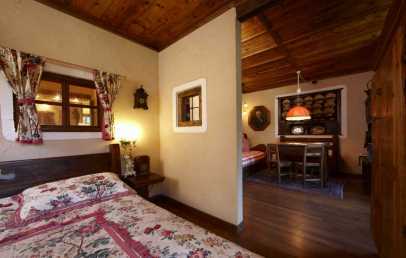 All small double rooms have view on the village. Some have a balcony. The bathroom have two washbasin and bathtube. 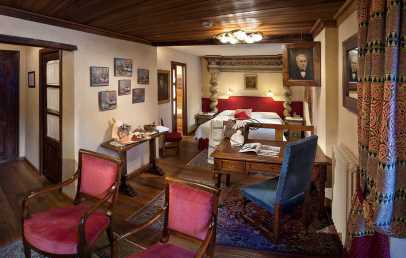 The superior double rooms have wooden floors (except one that has a stone floor), some have a balcony, the other a four poster bed. All the superior double rooms have a separate dressing corner, some have shower, other with bath tub. 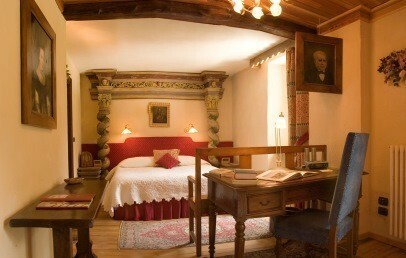 Most of the superior double rooms are corner rooms, located on the street side. 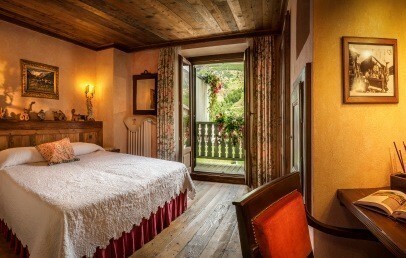 The deluxe double rooms have wooden flooring, one or two balconies (except for one which has an attic and no balcony but, having a double room interconnecting with a smaller room with two children’s beds, it is ideal for a family). The bathrooms have double basins, bathtub and separate shower. 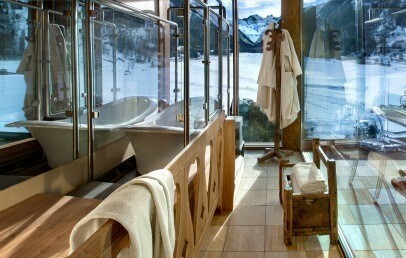 The junior suites have balcony and view to the Grand Paradiso glacier. All have a dressing room separated and bathroom with two washbasins, bath tube and separated shower, two tv. The chalet are located in front of main building, each on two floors. Lou Beu and Lou Mayen have one room with king size bed and bathroom at first floor and a living room area with water fire-place at the ground floor. The bathroom have a shower. The chalet are located in front of main building, each on two floors. La Cheminée is composed by two rooms, two bathrooms (one with jacuzzi king size) and a living room area with water fire-place. 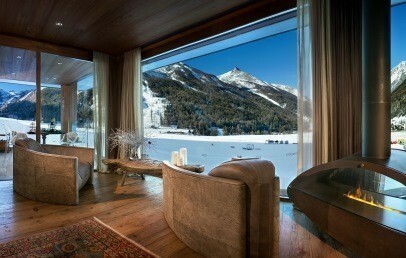 New panoramic suite with 180° view on the Sant'Orso fields and on the Gran Paradiso Glacier and on the Mont Blanc. Four posted bed, water fire-place, external bath tub.